Hot engines on a cold evening. 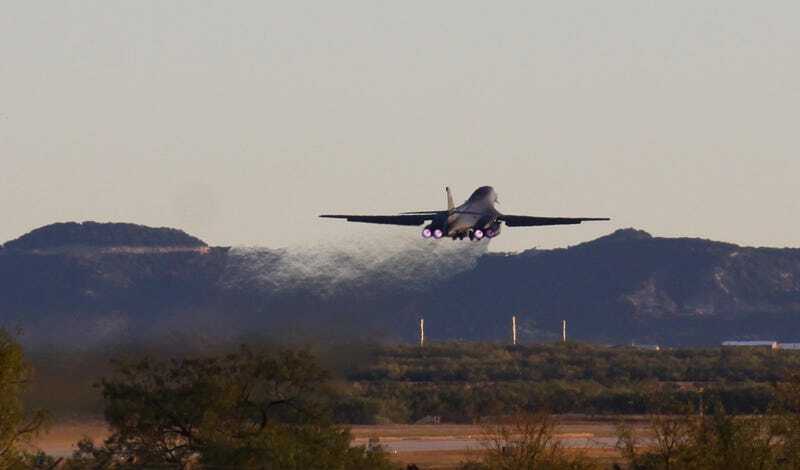 A B-1 Lancer takes off into the dusk from Dyess AFB in Abilene, TX. I could have done with a 300mm lens, as it was probably close to a mile away when I took this shot. However, when the pilot lit the afterburners at the north end of the runway, he was probably about 200 yards away. I could feel the sound in my chest, and the car was vibrating. Quite a noise. There wasn’t much else in the air this evening, though I did get shots of a C-130J as it was coming in, beautifully lit by the low December sun. I like it when you can see the pilot in the cockpit.